We’ve all been there! Your phone always dies at the worst time. Have you noticed that the more you use your phone the faster it dies? How about your tablet or laptop? A lot of people carry all three. Well now you can alleviate this problem for your consumers while promoting your business at the same time! Last year we decided to drive to our vacation destination. Halfway through our ride we had to find an electronics store to purchase a USB car charger for our devices before they died. The car charger we purchased only had one port and cost us over $10. If a company had given me one as a take away before my trip I would still remember that company logo. The USB Car Charger from Garrett Specialties allows you to charge up to two devices from your car lighter outlet at the same time. That means more battery life for your phone in case of an emergency and movie time on your iPod or Laptop for you or the kids. 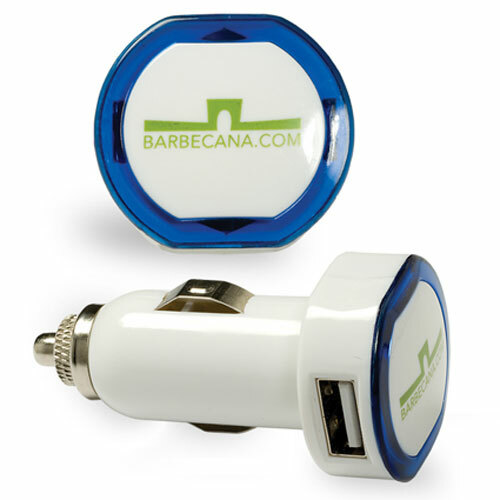 This promo item is something that can be used in everyday life but unlike a stress ball or refrigerator magnet it is mobile. From college students to co-workers, babysitters to Fortune 500 executives, anyone that has a car is likely to see your logo on this custom electronic giveaway. The best thing about this product is that it is mobile and there is no better way to maximize your exposure than through mobility. A USB car charger is probably the last thing anyone would think of receiving, but who would pass it up? This shows your client/customer that you are current. It is important to keep your company’s promotion simple and yet be relatable. When was the last time you took a long, hard look at your current promotional products? Customer’s needs are constantly changing. Technology is updated daily and although there is almost no way to keep pace with the rate of change in terms of technology, we can make our advertising products are compatible where possible. Are your promotional products keeping pace with an every changing market? Do you see this as an opportunity to expand promotional services within your own company?